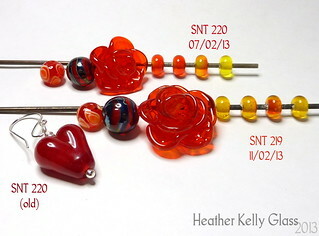 I did make a few more beads with the reds at the weekend. These lentils definitely illustrate the difference between the reds! I should have done them first, probably, but was having fun with the other designs. 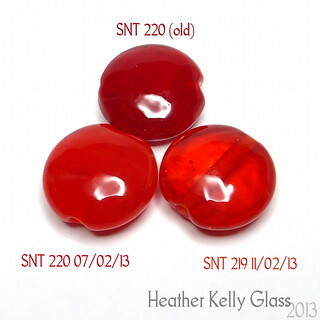 The difference in transparency between the new SNT 220 and SNT 219 is much more obvious here. They’re basically the same colour, but the 219 is far more transparent. 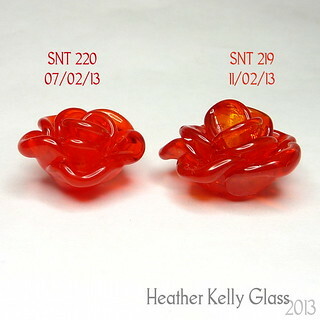 I included the old SNT 220 for comparison. 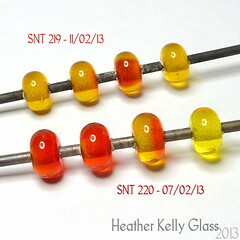 I was asked to check how this colour behaved when mixed with others so made a few beads this weekend. 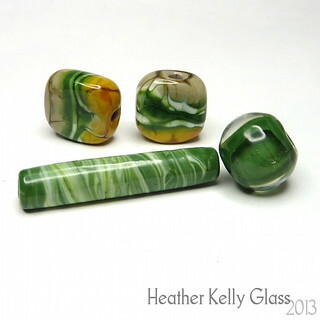 Here are the initial beads I made a while ago – the chromium green was used as the bulk of the body for all of these. 1. Two plain spacers, one etched. 2. A round with iris gold frit on the surface. 3. 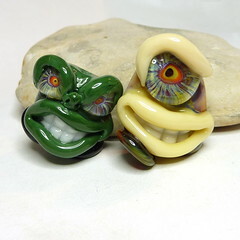 A gremlin with Wild Eye murrini eyes. 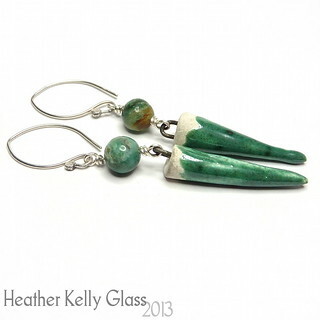 Chromium green comes in rough bumpy rods that are fairly brittle (but don’t seem shocky in the flame). Tiny subtle sparkly flecks can be seen in the surface sometimes. 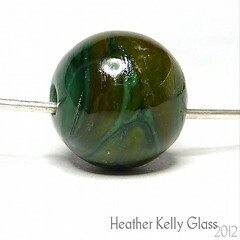 The round bead on the right is chromium green encased with Effetre 006, then chromium green stripes on the surface. 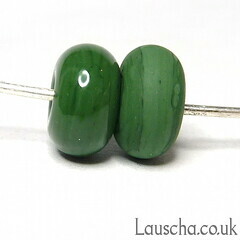 For the long tube bead, I first mixed together chromium green and Effetre white into a stringer, then made the bead from that. The two tiles at the back have bases of half-and-half Effetre red roof tile and sediment, then have a wrap of chromium green round the centre, one of silvered ivory on top of that, then another of chromium green. 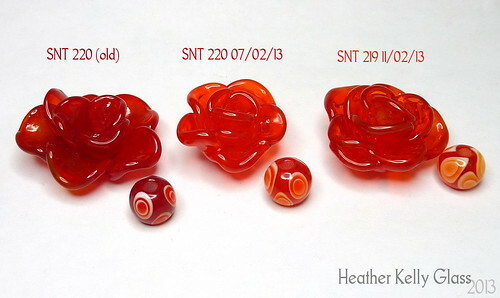 Those were melted in and the whole bead allowed to sag under gravity before shaping them into tiles again. 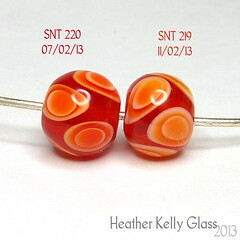 None of these beads have any incompatibility problems. I really like the tiles, may have to make more! 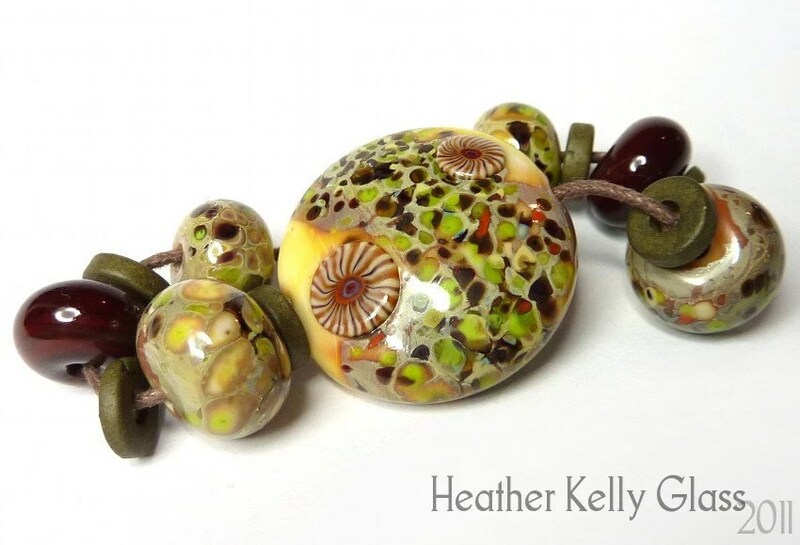 This week I used some of my lampwork beads: big hole and small hole discs in olive green and caramel brown, alongside some chunky copper wire-wrapping and earwires made from some of my copper headpins. 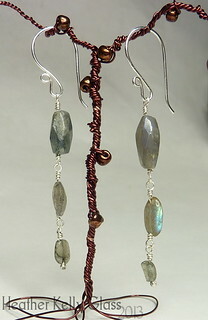 I have a little bag of assorted labradorite beads that I’ve been planning to use, so I got some of those out for this week’s earring pair. 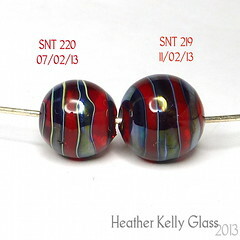 The beads are all different sizes so I didn’t worry about trying to match them, I just made sure that the overall length of the trio was the same. 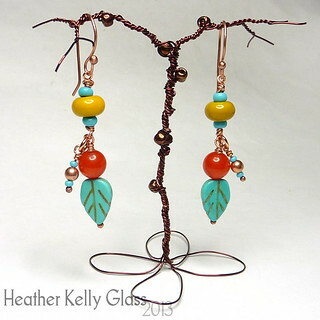 I wire-wrapped them with sterling silver, and my earwires are sterling too. 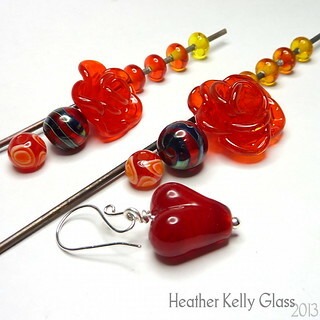 I made the little ball-ended headpins at the bottom – I’ve been making headpins of various sizes and materials using my Minor. Fine silver headpins are easy to make using my little soldering torch, but copper melts at a higher temperature so I could only get it to ball up reasonably just after refilling the torch, and only do a couple before the flame cooled again so I do copper ones on my Minor now. I did the sterling ones on there too in the same batch. I couldn’t find my Auflux so made them unfluxed and they’re a bit pitted but not too much. 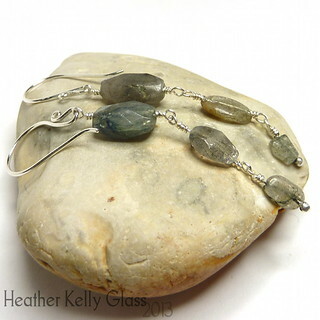 Labradorite has a beautiful iridescence that comes and goes as you turn the beads around. I’ve managed to capture a little in the photo below. It makes me think of water on rocks and sealskin, hence the title. It’s part 1 because I think the trove should have other treasures in it too!